What Does The Future Hold For Mobile Phones? Since the release of the first mobile phone in 1983, mobile technology has come a long way. Can you remember those enormous bricks you used to carry around in your pocket? I certainly do, I remember how primitive some of the earlier models of mobile phones were and how astounded we were by the ability to send an SMS message and phone our friends and family on a mobile device. We then went through a period of mobile phones getting smaller and smaller right up to the point where you could barely hit the correct buttons, the smaller the device you had the more status it gave you. Now we’ve seen an explosion in functionality since the arrival of smartphone technology. We now have small devices that manage to combine digital cameras, music players, internet connectivity and video recorders all in one handsets. We have now reached a point where our mobile phones are more like mini computers than phones. The amazing rise in popularity of smartphones, which have now gone from a business domain to everyday use, has highlighted the importance of mobile technology in the modern age. People are no longer content with owning and carrying numerous different devices or only being able to perform functions in a certain place and time.Now more than ever, customers are demanding all-in-one devices that can be used anywhere and everywhere.As an owner of an Android device myself I am literally gobsmacked by the sheer number of functions my phone boasts. With companies such as Google, Apple (with the iPhone), HTC, Samsung, Nokia, Microsoft and many others developing smarter handsets at a rapidly increasing pace there is just one question to ask. What does the future hold for mobile phones? We’ve compiled this guide to the directions the technology may take. What could the phones of tomorrow possibly look like? What will we be able to do with the phones of the future? Predictions appear somewhat straight out of a sci-fi movie or imagination! Future technology will enable mobile phones to literally get under our skins, dominating our lives, thanks to skin implants. Unlike today’s phones, experts believe future mobiles will be broken into components, capable of operating as assistants to shield us from overloads of information. Well one thing is for sure, we’ll continue to see this integration of online services and other hardware. How many of us now plug our phones into our stereos and TVs to access our music and video collections, and how many of us do most of our web browsing on our phones? The truth is we’re all spending more and more time on our phones because our phones enable us to complete more of our daily tasks. As we’re currently developing newer efficient screen technologies it makes sense that our mobile phones in the future will have even smarter screen capabilities. We may not even need to touch the screens in the future as cameras and sensors now have the ability to recognise a series of hand gestures. The phones in the future are also likely to have better voice recognition capabilities, who knows, your phone may even have a programmed personality and talk back to you, reading you the news, your messages and also the weather. We will probably begin to see holographic 3D technology being incorporated fairly soon providing us with a 3D experience without the need for glasses, and we’ll also no doubt see resolutions grow and grow. The iPhone 5 already has stunning resolution with the retina display so imagine a resolution 3 or 4 times bigger. Unlike today, we will spend less time fidgeting with our phones, as smarter advanced technology takes over. Smarter phones will have the power to buy, sell and generally take decisions at our behest. As technology advances, humanity will spend less time on desktops, better manage time and save money. Phones may even help save lives in future. 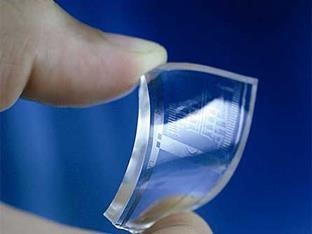 Another development we’re likely to see in the next few years is the flexible screen. Sony has already developed this technology and as prices of production decrease we can expect to see a new wave of development in mobile telecommunications. Imagine being able to roll out the screen from your phone so it is closer to the size of a tablet but can be rolled back to fit in your pocket. This kind of technology really does have the potential to make our laptops and desktops obsolete. As screens become more flexible developers are provided with a whole new avenue of potential options. Physical designs of mobile phones will really evolve and we could start to see a whole range of weird and wonderful designs. We could even see phones become fashion accessories as the super flexible screens would be able to display any image you wish. Imagine a phone that could be wrapped around your wrist and used as either a bracelet or a watch that can be customised to look like whatever you want it to. As technologies continue to develop I’m sure we’ll see the phones of the future incorporating new advanced technologies to enhance their design and usability. Some of the phones currently in development are being designed to incorporate projection technology, so in theory we could begin to see our TVs and projectors being replaced by mobile phones. As well as projection capabilities advances in infrared keyboard projection technology could provide mobile phone users the ability to project a light based keyboard onto a surface which could be used like a regular sized PC keyboard. The problems experienced by people with large fingers would be a thing of the past. If we look a long way into the future it makes sense that our phones will incorporate highly advanced technologies such as nanotechnology allowing your phone to do tasks such as clean itself, or scan your food for harmful toxins. With nanotechnology the options would literally be endless in developing mobile phone technology. As well as nanotech another conceptual technology for the future of phones is translucent photonic circuitry. Imagine your phone being nothing more than a translucent block with a high resolution display taking all of the energy it needs to run from its surrounding environment. 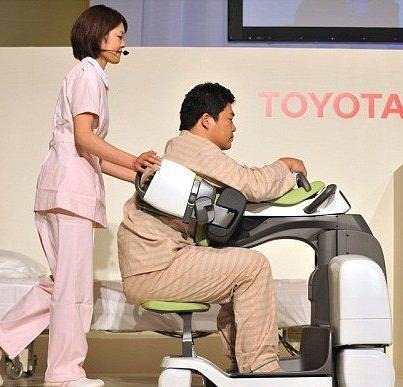 These technologies are being developed right now and I have no doubt we’ll see these in the future. There are an infinite number of potential avenues for the mobile telecommunications industry to explore. I have only covered a few in this article. There are numerous different control systems proposed for the future and it will be a while before we discover which one will reign supreme. However, we have had a glimpse of the potential future with existing voice command technology. Being able to control your entire phone just by speaking to it may seem a little strange at first, but we may soon see everyone strolling around seemingly talking to themselves if the technology really takes off. If you don’t like that idea, then developments in touch screen technology may also point to a different future. Phones that employ three dimensional screens, that can move and adjust to touch and what’s being displayed may be an option. This would also open the door for screens that could display texture; a picture of a rock would be rough, while silk incredibly smooth and so on. There is the potential for phones that are nothing but one big touch screen, on which you could move items anywhere. Whatever the future of mobile phones, we can count on witnessing some extraordinary technological developments. Future phones will be mini gadgets, the size of a candy bar. Tablets will be broken down into components and 3D, augmented reality glasses will offer quality display. As for the audio, your earring stud will effectively do! Future technology may seal the gap between real and virtual with a complete physical interface to the digital and virtual worlds. Emerging technologies around mobile telephony already promise an interesting future, for instance the use of biometrics to monitor ailments, using mobile phones to monitor mood and provide countering alternatives etc. Whereas such predictions may be hard to make, the fact that mobile telephony has experienced a boom like no other in less than a decade means more data is being mined that will lead to cutting edge technology to produce even smarter phones. 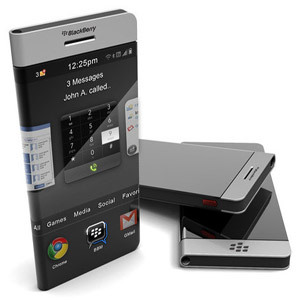 What do you think about the future of mobile phones? Do you think we’re going to see some significant developments in this industry or will it evolve into something completely different? Maybe you don’t see any point in advancing the technology any further. Whatever your thoughts are on this I’d love to hear them. Please feel free to leave a comment. So What Is This Graphene Fuss All About? Advances in delivering and storing electricity are crucial to the future of electric cars and otherwise reducing reliance on energy produced from burning fossil fuels. Yet a powerful means of running electronics that can charge and discharge quickly while also storing large amounts of energy has long eluded scientists. Electrochemical capacitors made using graphene—a one-atom-thick sliver of graphite—began showing potential to boost storage capacity a few years ago. Individual graphene sheets create a larger surface area than when they are stacked together as a piece of graphite. This larger surface area increases energy storage capacity. 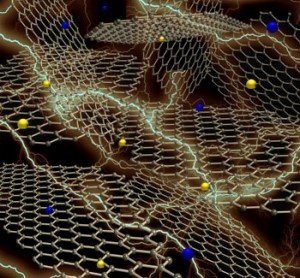 Yet the strong electrostatic attraction between graphene sheets makes graphene a difficult material to work with because it tends to cause them to stack back together into their original graphite form. The researchers, led by UCLA Ph.D. candidate and Cairo lecturer Maher El-Kady and Richard Kaner, a professor in UCLA’s Chemistry & Biochemistry and Material Sciences & Engineering departments, found a way to avoid this re-stacking. They covered an ordinary compact disk with a sheet of plastic, coated that plastic with graphite oxide and used a LightScribe DVD optical drive to locally heat the coating to turn it into a graphene film that can store energy in a highly-reversible electrical form important for many present and emerging applications. Electrodes made from laser-scribed graphene can also be bent without any obvious change in their electrical properties, the researchers say. This holds promise not only for improved electrochemical capacitors but also for flexible gadgets, such as roll-up computer displays and keyboards as well as wearable electronics. Such thin, highly flexible energy storage devices could lead to fabric electrochemical capacitors that store harvested body movement energy, potentially useful for making garments or military uniforms with embedded electronics, observes John Miller, president of JME, Inc., a Beachwood, OH, firm that offers engineering, performance testing and other services to electrochemical capacitor makers, in a commentary accompanying the Science report. Imagine car seats that heat up without a driver needing to flip a switch or electronic wallpaper that could change patterns or alter its brightness depending upon lighting conditions, Miller adds.